The FAANGs seem to have lost some of their bite. The very same stocks that have led the market higher for the last two years now seem to be the ones that are dragging the big stock indices lower in March. As go the FAANG stocks -- the group of stocks made up of Facebook (FB - Get Report) , Apple (AAPL - Get Report) , Amazon (AMZN - Get Report) , Netflix (NFLX - Get Report) and Google's parent company Alphabet (GOOG - Get Report) (GOOGL - Get Report) -- so too goes the market. As of this writing, these five companies make up a whopping 12% of the S&P 500's total market capitalization. Facebook, Apple, Amazon and Alphabet are a holdings in Jim Cramer's Action Alerts PLUS Charitable Trust Portfolio. But with FAANGs showing weakness in this market, it's leading some investors to wonder: Are the best retirement names in the tech sector suddenly not smart to own for your retirement portfolio? The good news is that it still makes sense to buy the FAANG stocks ... some sooner than others. To figure out how to trade them, we're turning to the charts for a technical look. At a glance, it's clear that some FAANG stocks are still "working" in this environment. Amazon and Netflix have largely managed to side-step much of the correction that peers have been experiencing. At the same time, Apple has shown stellar relative strength vs. the broader market, holding up closer to all-time highs while the S&P 500 was re-testing February's lows for a second time this week. While Alphabet has been somewhat less outright bullish, both classes of shares are still managing to hold above the psychologically important $1,000 level, a price floor that's shown technical significance stretching all the way back to last fall. In fact, the only FAANG chart that needs much closer inspection right now is Facebook. The 17% correction in Facebook has been exacerbated by an event-driven catalyst in the company's privacy scandal. At midday Monday, the stock was trading at $155.73, off 2.5%. Facebook violated its uptrend back in mid-March, and shares really haven't looked back. 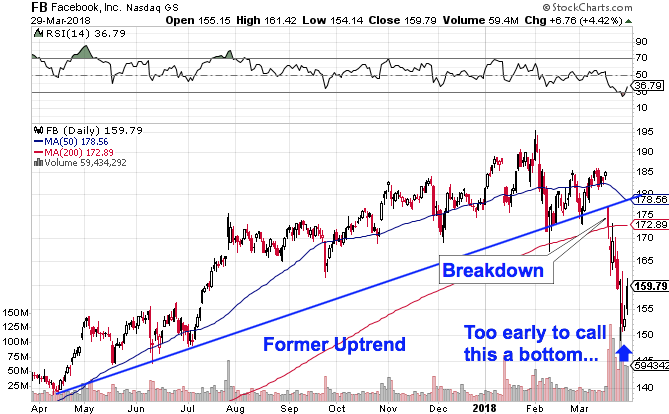 That trendline break was the key signal that something had changed in a bad way in Facebook, and it really hasn't had time to fully play out at this point. Simply put, it's still far too early to call last week's lows a bottom. Facebook is the only FAANG stock that was materially below its 200-day moving average Friday, suggesting that the long-term bullish trend in four of the five FAANGs is alive and well right now. Or, more to the point, the existence of buying pressure signaled by Thursday's market bounce makes the first week of April look like a buying opportunity for each FAANG except Facebook. Make no mistake, Facebook is still an attractive company in the long run, but until the privacy scandal is litigated in the market, shares could have further downside risk ahead. Shares' downward trajectory needs to get reversed before it makes sense to be a Facebook buyer again. 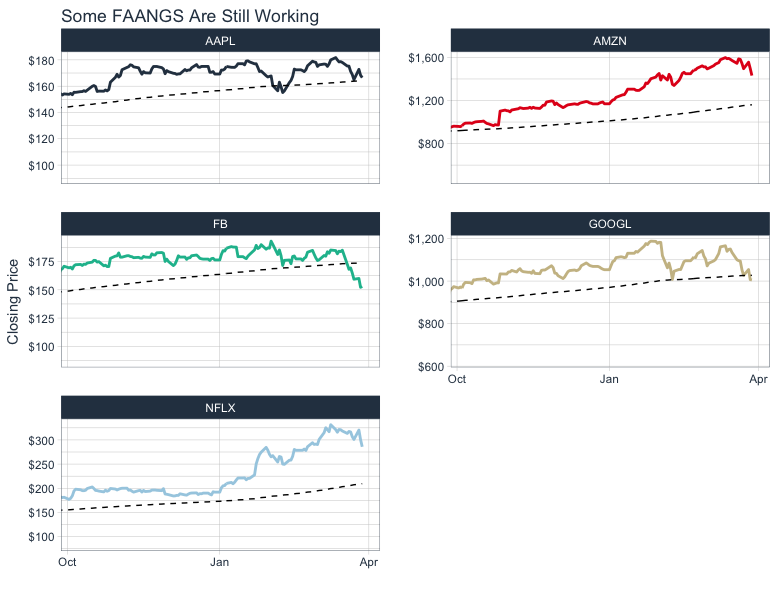 In the meantime, the trend is still a friend to retirement investors in the other four FAANG stocks.